This week I spoke to Hayley from Borrowed and Blue. Hi Hayley, can you please explain what your company does? 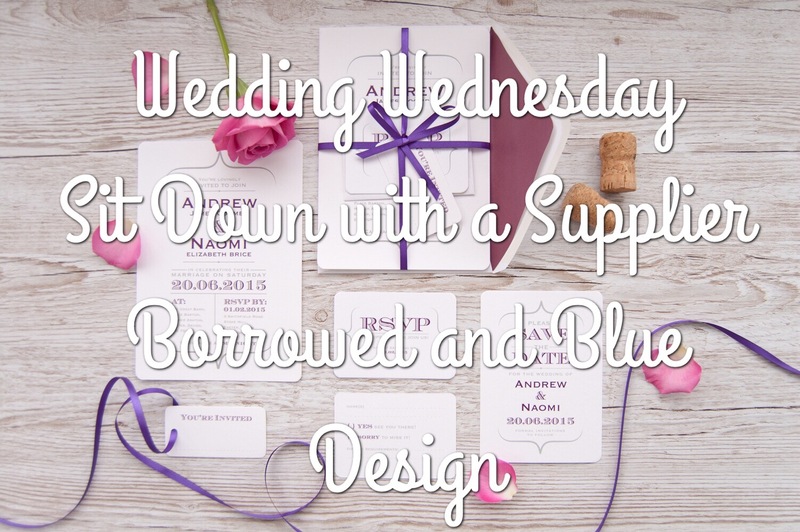 Here at Borrowed and Blue Design we specialise in creating beautiful wedding stationery and paper goods to set the tone for your big day. We offer customisable House collections and a full- bespoke design service. Within our House Collections we have taken inspirations from stylish current design trends, with a mix of contemporary and classic typography creating the perfect balance between modern and traditional. Our bespoke design service offers lovely couples the chance to design something unique and personal to them. Starting with a blank canvas I work closely with each couple to create something to suit their taste and style, whilst helping to make their wedding stationery unforgettable. Never underestimate what your special day is about and don’t get too consumed or stressed over everything. So much preparation and planning goes into a wedding day and it’s easy to get lost and forget what the day is really all about! As a designer I find that having a deadline for stages is a great way to organise and plan, and also manage your expectations. My top tip for couples when looking for wedding stationery is, if you’ve seen something that you like but it’s not quite the right colour / wording etc that you’ve dreamed of for your big day, then always ask if it can be customised. This is why I provide customisation options, which help make a great first impression of such a momentous celebration to come. As a relatively new company to the wedding industry I have found everyone who already works within the industry to be so helpful and welcoming. As a designer I love working closely with individual couples to create something special for them, It’s the little details that make a big difference. I think that rose gold / copper will still be a big trend for the coming year, while modern and traditional design will always be timeless classics. Personalisation has also become hugely popular with modern day couples, which is why we offer the option for couple to customise the designs colour scheme to suit their individual taste or theme. Having a great photographer / videographers at your wedding helping to make those memories you can cherish forever. Having a good band or DJ at a wedding always helps to get the evening party going. As a country girl at heart, my dream venue would be a converted barn or Georgian house in the countryside with beautiful grounds. Thanks for chatting with me Hayley! You can check out the Borrowed and Blue website to see their designs. Borrowed and Blue are also on Instagram.